april 10, 2000. Days of our lives. No soap opera could duplicate the scenario that Amos Brown has scripted. The powerful Baptist minister gave a month’s notice to his tenants — a grandmother, her disabled son, and two-year-old grandson — so he could move in. The recipients of his un-Christian charity, who survive on a Section 8 housing subsidy, turn out to be named Love. Brown says, "It’s my house, and I can do what I want." What he wants is to be elected supervisor from District 11. If the good preacher really feels his calling is to serve this economically struggling district, surely Third Baptist could be persuaded to sell the Ingleside Terrace house where he currently resides and purchase one in Oceanview or Excelsior, where "For Sale" signs abound. In the present housing market, the church would make a tidy profit, and the hostile criticism would subside. On the other hand, it’s unlikely that Brown’s critics would vote for him under any circumstances. And a second home, outside the district, will provide a refuge when political pressures overwhelm. Monsters on the march. The construction boom is moving west. As residents of Noe Valley watch in frustration, developers are razing small, single-family houses and erecting "monster homes" and multi-unit condos in their place. It’s a march gone mad, observes Jeannene Przblyski in the Noe Valley Voice: "The Planning Department has no road map for reasonable development, no set of guidelines for planned growth in the residential neighborhoods." The Collingwood Hill Neighborhood Association is trying to quell the invasion, which threatens the neighborhood’s traditional economic diversity. (Sound familiar?) But once again, it’s a case of amateurs against the pros. Land-use attorneys refuse to help, "conflicted out" because of their association with developers. The association finds itself scrambling as developers demand speeded-up hearing processes. The solution, Przblyski argues, is a moratorium on new demolitions and residential constructions while we take a good hard look at the kind of city we want to create. Mi casa es su casa. City Hall is "not Taj Ma-Willie. It's your building,'' Our Mayor announced hospitably as he cut a ribbon in front of the refurbished building a year ago. 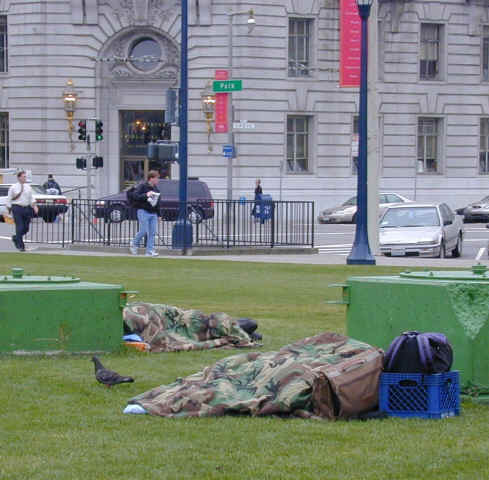 Echoes of his statement hovered over Civic Plaza last Tuesday, where a couple of sleeping bags had set up camp, their camouflage-colored olive and tan covers standing out against the bright green lawn. The picture springs to mind of City Hall’s vast lobby lined with sleeping bags and shopping carts, serving the people on a second shift, after the suits and tourists have left for the day. Mike Weiss reported in a recent Sunday Examiner article that homeless people are putting the new library to good use. Of special value are the restrooms, a private place to clean up and change clothes. The new City Hall’s restrooms are large and clean, located just behind the café at the edge of the lobby. The only barrier — visitors must pass through the metal detectors to reach them.